The cut of a diamond is the most important factor in determining a diamond’s fire (the scattering of white light into all the colors of the rainbow), brilliance (internal and external white light reflected from a diamond) and scintillation (the amount of sparkle a diamond produces, and the pattern of light and dark areas caused by reflections within the diamond). A diamond with a poor cut will not sparkle as much as a diamond with a high quality cut. 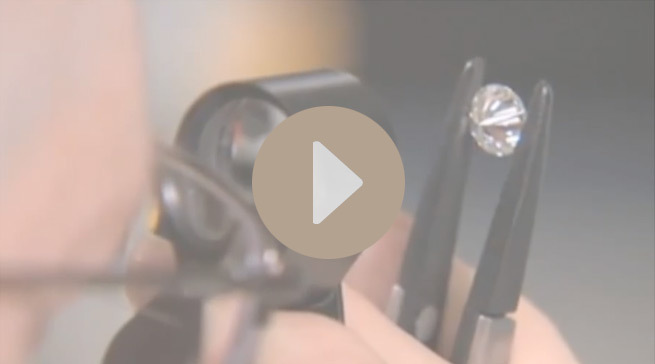 Unlike the rest of the 4Cs (colour, clarity and carat weight), the cut is determined by the skilled diamond cutter, so this is a factor that should not be comprised on when selecting your diamond. A diamond’s cut is not about its shape, but rather how well a diamond’s facets interact with light. Precise artistry and workmanship are required to fashion a stone so its proportions, symmetry, and polish deliver the magnificent return of light only possible in a diamond. 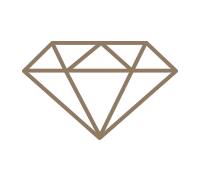 A well proportioned, perfectly cut diamond may be of higher value than a bigger diamond of a lesser quality cut. A diamond’s cut is measured on a scale from Excellent, Very Good and Good to Fair and Poor. GIA's diamond cut grade also takes into account the design and craftsmanship of the diamond, including its weight relative to its diameter, its girdle thickness (which affects its durability), the symmetry of its facet arrangement, and the quality of polish on those facets. The distance from the bottom of the diamond’s girdle to the cutlet is the pavilion depth. A pavilion depth that’s too shallow or too deep will allow light to escape from the side of the stone or leak out of the bottom. A well-cut diamond will direct more light through the crown.